Includes four corner brackets and two hold down straps. This kit will prevent cooler from moving around on the deck. take up less deck space. center hook for totally corrosion-proof mounting. 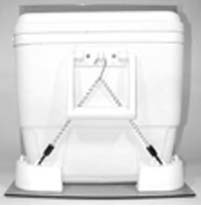 Fits virtually all sizes and makes of coolers including Igloo. Straps provide secure mounting and are easy to disconnect.